Getting To Know Jen Donald And Her Art. Let's warm this page up a bit, shall we? Every artist says "I was born to create". Ok, I say that too. I was the little girl who sneaked art coffee table books out of the library and hid them in my very messy desk because the librarian said I was too young for them. I stared at those pictures until they burned into my brain! I couldn't tell you what the painting was called, but I could show you exactly which book it was in and what page! I was a 7 year old art junkie. Why the fascination with nostalgia? My parents had a lot of records and mostly due to the pictures on the album covers, I'd ask Mom to play them over and over. The soundtrack to my childhood was big band music and old radio shows, combined with all the antiques my mom collected and voila! you have my passion for a lifetime! So why do I create now and where do I want to go? I often think that people are so busy in their lives that they stop seeing the beauty, the silly, the fun, the joy in the simplest things. Like "Tune In Next Week", we tend to forget how cool it was to hear a story told to us and the excitement we felt as the climatic ending came. Or "Winter's Flowers" and the beauty of a weed. Yep, a weed. I have won several awards and my paintings hang in many private collections. You can read about that below, and for 2012, I want to push myself outside of my comfort zone and find new ways to give my clients exciting and innovative works to own for their enjoyment. I'm a transplanted Virginian via Detroit, Michigan and live in Colonial Beach, VA. I have a grown son and daughter who somehow survived their "crazy mom", and my spoiled dog, Lacey Lou. It is a priority for me to promote the arts culture and support other local artist friends and patrons in the Colonial Beach area of Virginia. I am honored to be the 2011 and the 2012 Executive Board Secretary and a Founding Member of the Tappahannock Artists' Guild. So......... let's chat sometime. Give me a call, email me, or let's just go have a cup of coffee. We'll talk. Previous showings included Peddlers Market in Colonial Beach, General's Ridge Vineyard, Gresham House Gallery, Tappahannock Art Gallery, and Java Jacks in Tappahannock, Sidney King Art Center in Bowling Green, Dorothy Hart Community Center, Virginia General Assembly and Libertytown Arts in Fredericksburg. September 2015 Designing artist and project manager for the Colonial Beach, Virginia Loveworks LOVE sign. August and September 2012 - Featured Artist of the Month, Java Jacks Coffee House, Tappahannock, VA.
April 21, 2012 - Featured Artist of the Month, Tappahannock Farmers Market, Tappahannock, Va. with Blackstone Va. artist, Jerry Dance. April 20, 2012 - "Are We Having Fun Yet?" Opening, Tappahannock Art Gallery, Tappahannock, Va. with Blackstone Va. artist, Jerry Dance. 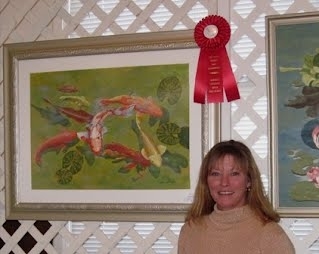 September 2011 - Featured Artist of the Month - Tappahannock Farmers' Market.